Just wanted to let you know of my Red letter session on St Johns on Saturday 9th and Sunday 10th May. 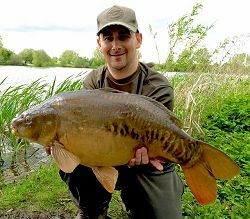 Having given up carping 10yrs ago this was only my second session back on the bank fishing and what a session it turned out to be. 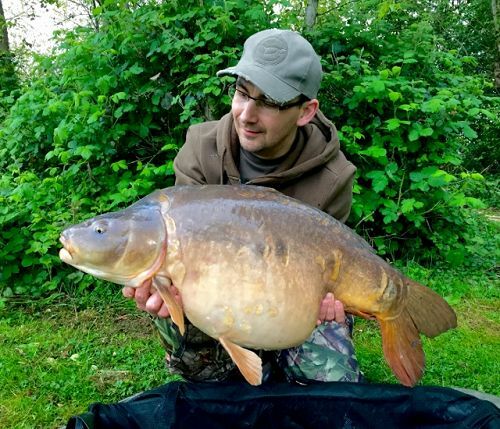 Fishing St Johns for the second time in 2 weeks I came back with a small amount of confidence having landed a 19lb Mirror on my first trip while also seeing my mate bank a 19lb Mirror and a 35lb.2 Mirror – the first 30lb fish I’d seen on the bank!!! Starting off the session I went with just a simple IQD rig and single Mainline IB wafter in the margins on one rod and a combi rig and pop up (Nutta S corkball) at 45yrds over a scattering of DNA Nutta S boilies and chops with the other. A couple of hours in to the session while I was sorting some bait out my margin rod alarm screamed off and after a 15min battle my mate slipped the net under a decent sized fish, straight away he highlighted my PB had been smashed and I was trying not to believe him!! While I tried to keep my nerve I got the scales, camera and weigh tripod before taking a look at size of the prize in the net. Lifting it out the water and onto the unhooking mat it was clear he was right.... the scales went round to 36lb 14oz and to say I was buzzing might just’ve been an understatement!!! My mate did the honours with the pictures and 5 mins later I was sat back in my bivvy in total shock. I’d forgot how good it feels and knew this was the reason why I wanted to come back to a past time I enjoyed so much in my youth. However around 1hr after the first fish, my baited spot rod screamed off and after a short but good fight we slipped the net under what turned out to be a lovely looking mirror weighing in at 19lb. Some quick photos and she was back amongst the monsters of St Johns. Over the next hr or so fish were showing constantly around the area and I was confident of another bite. Feeling my chances would be increased had I got 2 rods on the baited area I reeled my margin rod in and changed the rig to the combi rig and pop up. While adjusting the rig some good fish again showed... firstly over the baited area and then over the margin area so I stood trying to decide on where to put my second rod for at least 5 minutes.... after a short battle with myself I stayed with my original choice and dropped the rig on the edge of my baited spot. After sinking the line and placing the rod on the rest I then clipped the bite indicator on the line.... just as I let go of the indicator the line sprung from the clip and started peeling of the reel and I was in again. A short battle commenced and I was again gob smacked when a lovely looking common was in my net waiting to go on the scales... this time taking them up to 24lb 4oz. Well.... dinner was due and I was soon on the phone to a local delivery company as it was clearly my shout on the food!! A quiet night for my rods and alarms ensued but I was up at first light watching the lake and was happy to see lots of activity over the baited area of my swim... after an hour of watching all of the activity I was up like a shot when the line was again peeling from my baitrunner and 15 mins after picking up my rod I was holding what turned out to be the second 30 of my session!! The scales this time went round to 32lb 15oz, pictures taken and another beautiful mirror placed back I was again sat on my bedchair shocked with the last 18hrs action. 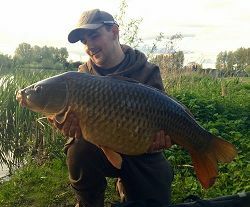 Unfortunately my mate had the situation of watching me catch while having nothing himself which was the only downside of what can only be described as the best session of my life!! Now I just cant wait to return to the Linear complex and I’m sure St Johns will always be a favourite venue of mine!!! 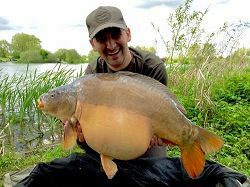 Kindest regards, tight lines to all anglers who try to catch the Linear carp! !